As my sister (family nickname The Terminator) pulled boxes off the top shelves of guest room closets and handed them to me, I could see her astonishment that we have kept so much junk. 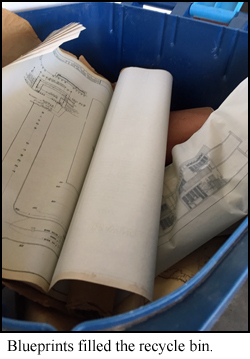 In one box were Jim’s blueprints from decades ago. I okayed them to go to the recycle bin. That box hadn’t been opened since we moved in this house 34 years ago. It was time. The next box held my memories from college, papers I’d written back when professors required students to write a great deal. I’d written eight short papers for one political science class. 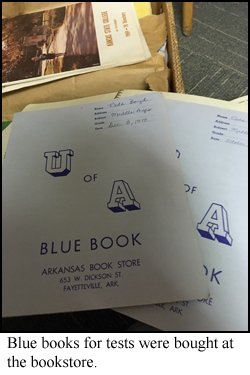 Remember having to buy blue books for essay tests? I also found spiral notebooks full of class notes. I’m sure I thought I’d refer to all those history facts. Never did. Recycle bin. I’ve also started cleaning out filing cabinets. Jim was licensed in eight states. All that paperwork––in the bin. How many decades do you keep income tax records? I feel a bit lighter by cleaning out detritus that was just taking space. But I took a bit of pleasure in thinking of the person I used to be when I took those notes and those tests. I am the same person, and I am not. I am wiser, taught through joys and sorrows, and I hope I’m more thoughtful of others instead of being as self-absorbed as I was when I was 20ish. That’s the plus side of years lived. On the minus side of these years lived, I’m not as adventuresome as I once was. I may have tossed blueprints, but the buildings still stand. 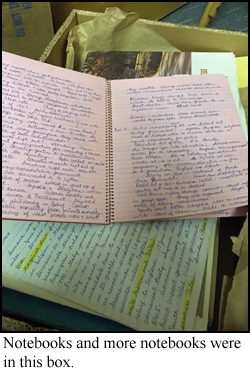 The history notes are gone, but the knowledge of how to research is still in my brain. And I’m thinking it’s time for an adventure.